The Byzantine calendar, also called "Creation Era of Constantinople" or "Era of the World" (Ancient Greek: Ἔτη Γενέσεως Κόσμου κατὰ Ῥ��μαίους, also Ἔτος Κτίσεως Κόσμου or Ἔτος Κόσμου, abbreviated as ε.Κ., literal translation of ancient Greek "Roman year since creation of universe"), was the calendar used by the Eastern Orthodox Church from c. 691 to 1728 in the Ecumenical Patriarchate. It was also the official calendar of the Byzantine Empire[note 1] from 988 to 1453, and of Kievan Rus' and Russia from c. 988 to 1700. Since "Byzantine" is a historiographical term, the original name uses the noun "Roman" as it was how the Eastern Roman Empire continued calling itself. The calendar was based on the Julian calendar, except that the year started on 1 September and the year number used an Anno Mundi epoch derived from the Septuagint version of the Bible. It placed the date of creation at 5509 years before the Incarnation, and was characterized by a certain tendency which had already been a tradition among Jews and early Christians to number the years from the calculated foundation of the world (Latin: Annus Mundi or Ab Origine Mundi— "AM"). [note 2] Its Year One, marking the supposed date of creation, was September 1, 5509 BC, to August 31, 5508 BC. It is not known who invented the World era and when. Nevertheless, the first appearance of the term is in the treatise of a certain "monk and priest", Georgios (AD 638–39), who mentions all the main variants of the "World Era" in his work. Georgios argues that the main advantage of the World era is the common starting point of the astronomical lunar and solar cycles, and of the cycle of indictions, the usual dating system in Byzantium since the 6th century. He also already regards it as the most convenient for the Easter computus. Complex calculations of the 19-year lunar and 28-year solar cycles within this world era allowed scholars to discover the cosmic significance of certain historical dates, such as the birth or the crucifixion of Jesus. This date underwent minor revisions before being finalized in the mid-7th century, although its precursors were developed c. AD 412 (see Alexandrian Era). By the second half of the 7th century, the Creation Era was known in Western Europe, at least in Great Britain. [note 3] By the late 10th century around AD 988, when the era appears in use on official government records, a unified system was widely recognized across the Eastern Roman world. its era was based on the year of creation, reckoned September 1, 5509 BC, to August 31, 5508 BC, rather than the foundation of Rome; years were also reckoned by their place in the indiction and not by the years' consuls. The leap day of the Byzantine calendar was obtained in an identical manner to the bissextile day of the original Roman version of the Julian calendar, by doubling the sixth day before the calends of March, i.e., by doubling 24 February. The earliest extant Christian writings on the age of the world according to the Biblical chronology are by Theophilus (AD 115–181), the sixth bishop of Antioch from the Apostles, in his apologetic work To Autolycus, and by Julius Africanus (AD 200–245) in his Five Books of Chronology. Both of these early Christian writers, following the Septuagint version of the Old Testament, determined the age of the world to have been about 5,530 years at the birth of Christ. An immense intellectual effort was expended during the Hellenistic period by both Jews and pagans to date creation, the flood, exodus, building of the Temple... In the course of their studies, men such as Tatian of Antioch (flourished in 180), Clement of Alexandria (died before 215), Hippolytus of Rome (died in 235), Julius Africanus of Jerusalem (died after 240), Eusebius of Caesarea in Palestine (260–340), and Pseudo-Justin frequently quoted their predecessors, the Graeco-Jewish biblical chronographers of the Hellenistic period, thereby allowing discernment of more distant scholarship. The Hellenistic Jewish writer Demetrius the Chronographer (flourishing 221–204 BC) wrote On the Kings of Judea which dealt with biblical exegesis, mainly chronology; he computed the date of the flood and the birth of Abraham exactly as in the Septuagint, and first established the Annus Adami – Era of Adam, the antecedent of the Hebrew World Era, and of the Alexandrian and Byzantine Creation Eras. The Alexandrian Era (Greek: Κόσμου ἔτη κατ’ Ἀλεξανδρεῖς, Kósmou étē kat'Alexandreîs) developed in AD 412, was the precursor to the Byzantine Era. After the initial attempts by Hippolytus, Clement of Alexandria and others[note 9], the Alexandrian computation of the date of creation was worked out to be 25 March 5493 BC. The Alexandrine monk Panodorus reckoned 5904 years from Adam to the year AD 412. His years began with August 29, corresponding to the First of Thoth, the Egyptian new year.Annianos of Alexandria however, preferred the Annunciation style as New Year's Day, 25 March, and shifted the Panodorus era by about six months, to begin on 25 March. This created the Alexandrian Era, whose first day was the first day of the proleptic[note 10] Alexandrian civil year in progress, 29 August 5493 BC, with the ecclesiastical year beginning on 25 March 5493 BC. March 25 was considered to be the anniversary of Creation itself. It was the first day of the year in the medieval Julian calendar and the nominal vernal equinox (it had been the actual equinox at the time when the Julian calendar was originally designed). Considering that Christ was conceived at that date turned March 25 into the Feast of the Annunciation which had to be followed, nine months later, by the celebration of the birth of Christ, Christmas, on December 25. The Alexandrian Era of March 25, 5493 BC was adopted by church fathers such as Maximus the Confessor and Theophanes the Confessor, as well as chroniclers such as George Syncellus. Its striking mysticism made it popular in Byzantium, especially in monastic circles. However this masterpiece of Christian symbolism had two serious weak points: historical inaccuracy surrounding the date of Resurrection as determined by its Easter computus,[note 11] and its contradiction to the chronology of the Gospel of St John regarding the date of the Crucifixion on Friday after the Passover. A new variant of the World Era was suggested in the Chronicon Paschale, a valuable Byzantine universal chronicle of the world, composed about the year 630 AD by some representative of the Antiochian scholarly tradition. It had for its basis a chronological list of events extending from the creation of Adam to the year AD 627. The chronology of the writer is based on the figures of the Bible and begins with 21 March, 5507. For its influence on Greek Christian chronology, and also because of its wide scope, the "Chronicon Paschale" takes its place beside Eusebius, and the chronicle of the monk Georgius Syncellus which was so important in the Middle Ages; but in respect of form it is inferior to these works. By the late 10th century, the Byzantine Era, which had become fixed at September 1 5509 BC since at least the mid-7th century (differing by 16 years from the Alexandrian date, and 2 years from the Chronicon Paschale), had become the widely accepted calendar of choice par excellence for Chalcedonian Orthodoxy. "opened for us today Paradise, which had remained closed for some 5000 years.". "for five thousand years five hundred and some years God left Adam (i.e. man) to labor on the earth.". "Let us omit the conjectures of men who know not what they say when they speak of the nature and origin of the human race...They are deceived by those highly mendacious documents which profess to give the history of many thousands of years, though reckoning by the sacred writings we find that not 6,000 years have passed. (City of God 12:10). Augustine goes on to say that the ancient Greek chronology "does not exceed the true account of the duration of the world as it is given in our documents (i.e. the Scriptures), which are truly sacred." "...from Adam to the flood 2242 years, thence to Abraham 1141 years, thence to the Exodus 430 years, thence to the passover of Joshua 41 years, thence to the passover of Hezekiah 864 years, thence to the passover of Josiah 114 years, thence to the passover of Ezra 107 years, and thence to the birth of Christ 563 years." "First he quotes Exod. xxv. 10f. and pointing out that the length, breadth and height of the ark of the covenant amount in all to 5½ cubits, says that these symbolize the 5,500 years from Adam at the end of which the Saviour was born. He then quotes from Jn. xix. 14 ' it was about the sixth hour ' and, understanding by that 5½ hours, takes each hour to correspond to a thousand years of the world's life..."
Around AD 202 Hippolytus held that Jesus was born in the 42nd year of the reign of Augustus[note 12] and that he was born in 5500AM. In his Commentary on Daniel he did not need to establish the precise year of Jesus's birth; he is not concerned about the day of the week, the month-date, or even the year; it was sufficient for his purpose to show that Christ was born in the days of Augustus in 5500 AM. From Justinian's decree in AD 537 that all dates must include the Indiction, the unification of the theological date of creation (as yet unfinalized) with the administrative system of Indiction cycles became commonly referred to amongst Byzantine authors, to whom the indiction was the standard measurement of time. "... as of the fifteenth day of the month of January last past, in the last fourth Indiction, in the year six thousand one hundred and ninety"
We find the era also in the dating of the so-called Letter of three Patriarchs to the emperor Theophilos (April, indiction 14, 6344 = 836 AD). By the 10th century the Byzantine Era is found in the Novellas of AD 947, 962, 964, and most surely of the year AD 988, all dated in this way, as well as the Act of Patriarch Nicholaos II Chrysobergos in AD 987. "In the year 6508 , in the thirteenth indiction, the emperor sent a great force against the Bulgarian fortified positions (kastra) on the far side of the Balkan (Haimos) mountains,..."
"The queen of cities fell to the Latins on the twelfth day of the month of April of the seventh indiction in the year 6712 ." The historian Doukas, writing c. AD 1460, makes a detailed account for the Creation Era. Although unrefined in style, the history of Doukas is both judicious and trustworthy, and it is the most valuable source for the closing years of the Byzantine empire. "From Adam, the first man created by God, to Noah, at whose time the flood took place, there were ten generations. The first, which was from God, was that of Adam. The second, after 230 years, was that of Seth begotten of Adam. The third, 205 years after Seth, was that of Enos begotten of Seth. The fourth, 190 years after Enos, was that of Kainan begotten of Enos. The fifth, 170 years after Kainan, was that of Mahaleel begotten of Kainan. The sixth, 165 years after Mahaleel, was that of Jared begotten of Mahaleel. The seventh, 162 years after Jared, was that of Enoch begotten of Jared. The eighth, 165 years after Enoch, was that of Methuselah begotten of Enoch. The ninth, 167 years after Methuselah, was that of Lamech begotten of Methuselah. The tenth, 188 years after Lamech, was that of Noah. Noah was 600 years old when the flood of water came upon the earth. Thus 2242 years may be counted from Adam to the flood. There are also ten generations from the flood to Abraham numbering 1121 years. Abraham was seventy-five years old when he moved to the land of Canaan from Mesopotamia, and having resided there twenty-five years he begat Isaac. Isaac begat two sons, Esau and Jacob. When Jacob was 130 years old he went to Egypt with his twelve sons and grandchildren, seventy-five in number. And Abraham with his offspring dwelt in the land of Canaan 433 years, and having multiplied they numbered twelve tribes; a multitude of 600,000 were reckoned from the twelve sons of Jacob whose names are as follows: Ruben, Symeon, Levi, Judah, Issachar, Zebulun, Naphtali, Gad, Asher, Dan, Joseph, and Benjamin. The descendants of Levi were Moses and Aaron; the latter was the first of the priesthood while Moses was appointed to govern. In the eightieth year of his life, he walked through the Red Sea and led his people out of Egypt. This Moses flourished in the time of Inachos [son of Oceanus and King of Argos] who was the first [Greek] king to reign. Thus the Jews are more ancient than the Greeks. Remaining in the wilderness forty years they were governed for twenty-five years by Joshua, son of Nun, and by the Judges for 454 years to the reign of Saul, the first king installed by them. During the first year of his reign, the great David was born. Thus from Abraham to David fourteen generations are numbered for a total of 1024 years. From David to the deportation to Babylon [586 BC] there are fourteen generations totaling 609 years. From the Babylonian Captivity to Christ there are fourteen generations totaling 504 years. By the sequence of Numbers we calculate the number of 5,500 years from the time of the first Adam to Christ.". "The Holy Fathers (probably unanimously) certainly have no doubt that the chronology of the Old Testament, from Adam onwards, is to be accepted "literally." They did not have the fundamentalist's over-concern for chronological precision, but even the most mystical Fathers (St. Isaac the Syrian, St. Gregory Palamas, etc.) were quite certain that Adam lived literally some 900 years, that there were some 5,500 years ("more or less") between the creation and the Birth of Christ." "Thus then, if it is said, "In the beginning God created," it is to teach us that at the will of God the world arose in less than an instant,..."
"For all things, as the Prophet says, were made out of nothing; it was no transformation of existing things, but the creation of the non-being into a perfect form". The prophet cited by St.Hilary was the mother of the Maccabean martyrs, who said to one of her tortured sons, "I beseech you, my child, to look at heaven and earth and see everything in them, and know that God made them out of nothing; so also He made the race of man in this way" (2 Maccabees 7:28). This text from 2 Maccabees was the standard biblical proof text for the Christian Church in respect to creation from nothingness. We find the thesis in late Judaism, from which it passed into the Christian faith as an essential teaching. In the Byzantine period, the day was divided into two 12-hour cycles fixed by the rising and setting of the sun. "Following Roman custom, the Byzantines began their calendrical day (nychthemeron) at midnight with the first hour of day (hemera) coming at dawn. The third hour marked midmorning, the sixth hour noon, and the ninth hour midafternoon. Evening (hespera) began at the 11th hour, and with sunset came the first hour of night (apodeipnon). The interval between sunset and sunrise (nyx) was similarly divided into 12 hours as well as the traditional "watches" (vigiliae) of Roman times." Marcus Rautman points out that the seven-day week was known throughout the ancient world. The Roman Calendar had assigned one of the planetary deities to each day of the week. The Byzantines naturally avoided using these Latin names with their pagan echoes. They began their week with the "Lord's Day" (Kyriake), followed by an orderly succession of numbered days: Deutera ("2nd"), Trite ("3rd"), Tetarte ("4th"), and Pempte ("5th"), a day of "preparation" (Paraskeve), and finally Sabatton. Each day was devoted to remembering one event of the life of Christ or the Theotokos or several martyrs or saints, whose observed feast days gradually eclipsed traditional festivals. Kyriake was seen as the day of resurrection of Christ and as both the first and eighth day of the week, in the same way that Christ was the alpha and omega of the cosmos, existing both before and after time. The second day of the week recognized angels, "the secondary luminaries as the first reflections of the primal outpouring of light", just as the sun and the moon had been observed during the Roman week. John the Baptist, the forerunner (Prodromos) of Christ, was honored on the third day. Both the second and third days were viewed as occasions for penitence. The fourth and sixth days were dedicated to the Cross. The fourth day to the Theotokos and her mourning of the loss of her son and the sixth day (the Paraskeue) as the day of the Crucifixion of the Lord, with holy songs sung and fasting in remembrance of these events. St. Nicholas was honored on the fifth day of the week, while the Sabatton day was set aside for the saints and all the deceased faithful. This order is still in use in the Orthodox Church and the Eastern Catholic Churches. A special arrangement of the way in which the hymns were sung was set for each day of the eight-week cycle, the "Octoechos (liturgy)". This cycle begins on the first Sunday after Easter ("Thomas-Sunday") and contains the texts whose content represents the meaning of the days of the week. The hymns sung on these eight weeks were performed with the use of eight different modes also called Octoechoi. 5537 BC – Julius Africanus (AD 200–245), Church historian. 5529 BC – Theophilus (AD 115–181), Bishop of Antioch. 5509 BC – Byzantine Creation Era or "Creation Era of Constantinople." (finalized in the 7th century AD). 5507 BC – Chronicon Paschale (c. AD 630), Byzantine universal chronicle of the world. 5500 BC – Hippolytus of Rome. (c. AD 234), Presbyter, writer, martyr. 5493 BC – Alexandrian Era (AD 412). 5199 BC – Eusebius of Caesarea, Bishop of Caesarea and Church historian (AD 324). 5199 BC – Mentioned in the Roman Martyrology,[note 13] published by the authority of Pope Gregory XIII in 1584, later confirmed in 1630 under Pope Urban VIII. 4963 BC – According to the Benedictine Chronology[note 14], which is founded on the LXX, the Creation of Adam is given this date (AD 1750). 3952 BC – Venerable Bede (c. AD 725), English Benedictine monk. 3761 BC[note 15] – Hebrew Calendar [Judaism] – (c. AD 222–276); or, (c. AD 358 – Hillel World Era). 3760 BC – Era of Adam, starts with creation of Adam. This era was used previously to the Hillel Era. Regarding questions about the scientific accuracy of the Genesis account of creation, and about various viewpoints concerning evolution, the Orthodox Church has not dogmatized any particular view. What is dogmatically proclaimed is that the One Triune God created everything that exists, and that man was created in a unique way and is alone made in the image and likeness of God (Gn 1:26,27). The opening words of the Nicene Creed, the central doctrinal statement of Christianity, affirms that the One True God is the source of everything that exists, both physical and spiritual, both animate and inanimate: "We believe in one God, the Father Almighty, Maker of Heaven and Earth, and of all things visible and invisible." In addition, our regeneration in Christ and the resurrection of the dead are both often called the "New Creation" (2 Cor 5:17; Rev 21:1). According to Fr. Stanley Harakas, the Bible's description of creation is not a "scientific account". It is not read for scientific knowledge but for spiritual truth and divine revelation. The physical-scientific side of the origins of mankind, though important, is really quite secondary in significance to the Church's message. 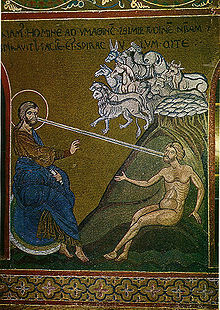 The central image of Adam as God's image and likeness, who also represents fallen and sinful humanity, and the new Adam, Jesus Christ, who is the "beginning", the first-born of the dead (Colossians 1:18) and the "first-fruits" of those who were dead, and are now alive (1 Corinthians 15:20–23), is what is really important. It may also be noted historically that while Byzantine officials and chroniclers were disconcerted by the ambiguities among the different dating and recording systems in the earlier centuries, these mattered little to most people who marked time by the orderly progression of agricultural seasons and church festivals, and by the regularity of holidays, weather cycles, and years that revealed the Divine order (Taxis) underlying the world. As the Greek and Roman methods of computing time were connected with certain pagan rites and observances, Christians began at an early period to adopt the Hebrew practice of reckoning their years from the supposed period of the creation of the world. Currently the two dominant dates for creation that exist using the Biblical model, are about 5500 BC and about 4000 BC. These are calculated from the genealogies in two versions of the Bible, with most of the difference arising from two versions of Genesis. The older dates of the Church Fathers in the Byzantine Era and in its precursor, the Alexandrian Era, are based on the Greek Septuagint. The later dates of Archbishop James Ussher and the Hebrew Calendar are based on the Hebrew Masoretic text. The Fathers were well aware of the discrepancy of some hundreds of years between the Greek and Hebrew Old Testament chronology,[note 16] and it did not bother them; they did not quibble over years or worry that the standard calendar was precise "to the very year"; it is sufficient that what is involved is beyond any doubt a matter of some few thousands of years, involving the lifetimes of specific men, and it can in no way be interpreted as millions of years or whole ages and races of men. To this day, traditional Orthodox Christians will use the Byzantine calculation of the World Era in conjunction with the Anno Domini (AD) year. Both dates appear on Orthodox cornerstones, ecclesiastical calendars and formal documents. The ecclesiastical new year is still observed on September 1 (or on the Gregorian Calendar's September 14 for those churches which follow the Julian Calendar). September 2018 marked the beginning of the year 7527 of this era. 1 AM (5509 BC) – Creation of the world. 4755 AM (753 BC) – Rome was founded. 4841 AM (667 BC) – City of Byzantium was founded. c. 5508 AM (1 BC) – Jesus of Nazareth was incarnated and born. c. 5541 AM (AD 33) – Jesus Christ's crucifixion and resurrection. 5838 AM (AD 330) – Constantinople (Greek rendered in Latin alphabet: Konstantinoupolis) becomes the new capital of the Roman Empire. 5888 AM (AD 380) – Christianity became the official religion of the Roman Empire by decree of Theodosius I. 5903 AM (AD 395) – Death of Theodosius I divides the Roman Empire into the East Roman Empire and the West Roman Empire. 6045 AM (AD 537) – Justinian I decrees that the indiction must be included when designating a Byzantine year. 6118 AM (AD 610) – After Greek became dominant also in the government at around AD 600, as it had been for many common subjects, the Eastern Roman Empire changed its official language from Latin to Greek. More than 100 years after the Fall of Constantinople (AD 1453), a German historian introduced the name "Byzantine empire" and "Byzantium" for the Greek period of the Eastern Roman Empire; this name finally became dominant among historians and cartographers. One conventional date for the start of the Byzantine period is this date of 600 AD. 6200 AM (AD 692) – Quinisext Council; first known official use of the Byzantine Era for dating; eschatological significance with this date connected with the Apocalypse of Pseudo-Methodius detailing a prophecy of the last emperor. 6388 AM (AD 880) – This year was significant eschatologically because it was 888 years from the Incarnation (based on 5500 AM as the date of the Incarnation). 6496 AM (AD 988) – Official use of the Byzantine Era by Basil II; Conversion of the Rus, Byzantine Era adopted in Russia. 6500 AM (AD 992) – Eschatological forecasts expected the end to occur in 6500 AM, the half-point of the 7th millennium. 6533 AM (AD 1025) – The conventional Byzantine date for the millennium anniversary of the Resurrection, with eschatological connections (based on 5533 AM as the date of the Resurrection). 6562 AM (AD 1054) – Great Schism. 6579 AM (AD 1071) – Romanos Diogenes is defeated at the Battle of Manzikert. Most of Anatolia is lost to the Seljuq Turks by 6589 AM (AD 1081). Beginning of the territorial decline of the Byzantine Empire. 6712 AM (AD 1204) – Sack of Constantinople by soldiers of the Fourth Crusade; Latin Empire established. 6769 AM (AD 1261) – Byzantine Empire re-established by Michael VIII Palaiologos. 6961 AM (AD 1453) – Fall of Constantinople leading to the final collapse of the Byzantine Empire. The civilization of Rome in its most inclusive sense, including both Ancient Rome and New Rome (Constantinople), lasted a total of 2,206 years. 7000 AM (AD 1492) – Millennialist movements in Moscow due to the 7000th year of the church calendar. 7018 AM (AD 1510) – Russian monk Philotheus of Pskov declares Muscovy to be the Third Rome. 7338 AM (AD 1830) – Greece attains independence from the Ottoman Empire according to the London Protocol. 7427 AM-7430 AM (AD 1919–AD 1922) Greek politician Eleftherios Venizelos attempts to implement the Megali Idea (recapture of Constantinople from Turkey) in the Greco-Turkish War (1919-1922), but in the course of the war Venizelos loses the election of 1920 and goes into exile and Greece is defeated by Turkey. 7500 AM (AD 1991-92) – Dissolution of the Soviet Union and Breakup of Yugoslavia. 7527 AM /͵ζφκζʹ ε.Κ. (AD 2018-19) – Current year AM, 1 September 2018 through 31 August 2019. ^ i.e. Eastern Roman Empire. The term Byzantine was invented by the German historian Hieronymus Wolf in 1557 but was popularized by French scholars during the 18th century to refer to the Eastern Roman Empire. The citizens of the empire considered themselves Romaioi ("Romans"), their emperor was the "Roman Emperor", and their empire the Basileia ton Romaion ("Empire of the Romans"). The Latin West designated the empire as "Romania", and the Muslims as "Rum". ^ Significantly, this same phrase – "from the foundation of the world", or "since the dawn of time", (Greek: από καταβολής κόσμου, Apo Kataboles Kosmou) – occurs repeatedly in the New Testament, in Matthew 25:34, Luke 11:50, Hebrews 4:3, 9:26, and Revelation 13:8, 17:8. Anno Mundi eras many reflect a desire to use a convenient starting point for historical computation based on the Scriptures. ^ PL XC, 598,877 (Pseudo‐Beda). ^ About the year 462 the Byzantine Indiction was moved from September 23 to September 1, where it remained throughout the rest of the Byzantine Empire, representing the present day beginning of the Church year. In 537 Justinian decreed that all dates must include the indiction, so it was officially adopted as one way to identify a Byzantine year, becoming compulsory. ^ This differed from the status of the Greeks who lived in the Western Empire, who generally employed Roman-style dating even in their mother tongue. ^ On the occasions when the Byzantines did employ the Roman method of dating, they were in fact liable to misunderstand it and consider the "3rd of the kalends" to refer to the third day of the month rather than the day before the end of the prior month. ^ To convert our era to the Byzantine era, add 5509 years from September to December, and 5508 years from January to August. ^ A calendar obtained by extension earlier in time than its invention or implementation is called the proleptic version of the calendar. ^ In the commonly used 19‐year Easter moon cycle, there was no year when the Passover (the first spring full moon, Nisan 14) would coincide with Friday and the traditional date of the Passion, March 25; according to Alexandrian system the date would have to have been Anno Mundi 5533 = 42(!)AD. ^ Roman Martyrology: Some Traditionalist Catholics use the year 5199 BC, which is taken from Catholic martyrologies, and referred to as the true date of Creation in the "Mystical City of God", a 17th-century mystical work written by María de Ágreda concerning creation and the life of the Virgin Mary. This year was also used earlier by the church historian Eusebius of Caesarea in 324. (V. Grumel. La Chronologie. 1958. pp.24–25). ^ Don Maur François d'Antine. Art of Verifying Dates. 4to, 1750. Printed again in folio in 1770. ^ Fr. Diekamp, "Der Mönch und Presbyter Georgios, ein unbekannter Schriftsteller des 7. Jahrhunderts", Byzantinische Zeitschrift 9 (1900) 14–51. ^ a b c d e f Pavel Kuzenkov (Moscow). "How old is the World? The Byzantine era κατα Ρωμαίους and its rivals Archived July 15, 2011, at the Wayback Machine". 21st International Congress of Byzantine Studies, London 2006. pp.2–4. ^ a b Paul Stephenson. "Translations from Byzantine Sources: The Imperial Centuries, c.700–1204: John Skylitzes, "Synopsis Historion": The Year 6508, in the 13th Indiction: the Byzantine dating system". November 2006. ^ Newton, Robert R. (1972), Medieval Chronicles and the Rotation of the Earth, Baltimore: Johns Hopkins University Press, p. 515 . ^ Butcher, Kevin (2003), Roman Syria and the Near East, Los Angeles: Getty Publications, p. 127, ISBN 9780892367153 . ^ Setton, Kenneth Meyer (1976), The Papacy and the Levant (1204--1571), Vol. I: The Thirteenth and Fourteenth Centuries, Memoirs of the APS, Vol. 114, Philadelphia: American Philosophical Society, p. 71, ISBN 9780871691149 . ^ "Οικουμενικόν Πατριαρχείον", ΘΗΕ, τόμ. 09, εκδ. Μαρτίνος Αθ., Αθήνα 1966, στ. 778. "Ecumenical Patriarchate". Religious and Ethical Encyclopedia. Vol. 9., Athens, 1966. p.778. ^ Prof. Charles Ellis (University of Bristol). Russian Calendar (988–1917). The Literary Encyclopedia. 25 September 2008. ^ Theophilus of Antioch. Theophilus of Antioch to Autolycus. Book III. Chap XXIV (Chronology from Adam) – Chap. XXVIII (Leading Chronological Epochs). ^ Julius Africanus. Extant Writings III. The Extant Fragments of the Five Books of the Chronography of Julius Africanus. ^ a b c Fr. Seraphim Rose. GENESIS, CREATION and EARLY MAN: The Orthodox Christian Vision. St. Herman of Alaska Brotherhood, Platina, California, 2000. p.236. ^ Ben Zion Wacholder. "Biblical Chronology in the Hellenistic World Chronicles". in The Harvard Theological Review, Vol.61, No.3 (Jul., 1968), pp.451–452. ^ Elias J. Bickerman. Chronology of the Ancient World. 2nd edition. Cornell University Press. 1980. p.73. ^ Rev. Philip Schaff (1819–1893), Ed. "Era." Schaff-Herzog Encyclopedia of Religious Knowledge. New Edition, 13 Vols., 1908–14. Vol. 4, pp.163. ^ George Synkellos. The Chronography of George Synkellos: a Byzantine Chronicle of Universal History from the Creation. Transl. Prof. Dr. William Adler & Paul Tuffin. Oxford: Oxford University Press, 2002. ^ Van der Essen, L. "Chronicon Paschale". In The Catholic Encyclopedia (New Advent). New York: Robert Appleton Company, 1908. ^ St. John Chrysostom. Homily "On the Cross and the Thief" 1:2. ^ St. Isaac the Syrian. Homily 19, Russian edition, pp. 85 [Homily 29, English edition, p.143]. ^ Fr. Seraphim Rose. GENESIS, CREATION and EARLY MAN: The Orthodox Christian Vision. St. Herman of Alaska Brotherhood, Platina, California, 2000. pp.236. ^ a b c , George Ogg. "Hippolytus and the Introduction of the Christian Era". in Vigiliae Christianae, Vol.16, No.1 (Mar. 1962), p.4-6. ^ The Rudder (Pedalion): Of the metaphorical ship of the One Holy Catholic and Apostolic Church of the Orthodox Christians, or all the sacred and divine canons of the holy and renowned Apostles, of the holy Councils, ecumenical as well as regional, and of individual fathers, as embodied in the original Greek text, for the sake of authenticity, and explained in the vernacular by way of rendering them more intelligible to the less educated. Comp. Agapius a Hieromonk and Nicodemus a Monk. First printed and published AD 1800. Trans. D. Cummings, from the 5th edition published by John Nicolaides (Kesisoglou the Caesarian) in Athens, Greece in 1908, (Chicago: The Orthodox Christian Educational Society, 1957; Repr., New York, N.Y.: Luna Printing Co., 1983). ^ Doukas (c. 1460). Decline and Fall of Byzantium To The Ottoman Turks. An Annotated Translation by Harry J. Magoulias. Wayne State University Press, 1975. pp.57–58. ^ Fr. Seraphim Rose. GENESIS, CREATION and EARLY MAN: The Orthodox Christian Vision. St. Herman of Alaska Brotherhood, Platina, California, 2000. pp.539–540. ^ a b The Orthodox Study Bible. St. Athanasius Academy of Orthodox Theology. Elk Grove, California, 2008. p.2. ^ St. Basil the Great. Hexæmeron. Nicene and Post-Nicene Fathers of the Christian Church, 2nd Series (NPNF2). Transl. Philip Schaff, D.D., LL.D. (1819–1893): VOLUME VIII – BASIL: LETTERS AND SELECT WORKS. Wm. B. Eerdmans Publishing Co., Grand Rapids, Michigan. ^ St. Hilary of Poitiers. On the Trinity. Book IV, 16. ^ The Orthodox Study Bible (Septuagint). St. Athanasius Academy of Orthodox Theology. Elk Grove, California, 2008. p.653. ^ a b Fr. Patrick Henry Reardon. Creation and the Patriarchal Histories: Orthodox Christian Reflections on the Book of Genesis. Conciliar Press, 2008. pp.34–35. ^ Panteli, Maria; Purwins, Hendrik (2013). "A Quantitative Comparison of Chrysanthine Theory and Performance Practice of Scale Tuning, Steps, and Prominence of the Octoechos in Byzantine Chant". Journal of New Music Research. 42 (3): 205–221. ^ a b Barry Setterfield. Ancient Chronology in Scripture. September 1999. ^ Prof. Fr. Arsenius John Baptist Vuibert (S.S.). An Ancient History: From the Creation to the Fall of the Western Empire in A.D. 476. Baltimore: Foley, 1886. p.16. ^ Karl Hagen. "The Jewish Calendar". Polysyllabic.com. ^ The Orthodox Study Bible. St. Athanasius Academy of Orthodox Theology. Elk Grove, California, 2008. p.1778. ^ Fr. Stanley S. Harakas. The Orthodox Church: 455 Questions and Answers. Light & Life Publishing, Minneapolis, 1988. pp.88,91. ^ Prof. Fr. Arsenius John Baptist Vuibert (S.S.). An Ancient History: From the Creation to the Fall of the Western Empire in A.D. 476. Baltimore: Foley, 1886. p.21. ^ Chisholm 1911, section: Era of the Creation of the World. ^ Fr. Seraphim Rose. GENESIS, CREATION and EARLY MAN: The Orthodox Christian Vision. St. Herman of Alaska Brotherhood, Platina, California, 2000. pp.602–603. ^ Paul Magdalino. Byzantinum in the Year 1000. Volume 45 of The medieval Mediterranean : Peoples, Economies and Cultures, 400-1453. BRILL, 2003. p. 247. ^ Paul Magdalino. Byzantinum in the Year 1000. Volume 45 of The medieval Mediterranean : Peoples, Economies and Cultures, 400-1453. BRILL, 2003. pp. 254-257. "Main feasts and commemorations". Orthodox Church of America. Archived from the original on 2018-10-09. Retrieved 2018-10-09. The Era of the Creation at Jewish Encyclopedia. The Jewish Calendar by Karl Hagen (medievalist). Doukas. Decline and Fall of Byzantium To The Ottoman Turks. An Annotated Translation by Harry J. Magoulias. Wayne State University Press, 1975. George Synkellos. The Chronography of George Synkellos: a Byzantine Chronicle of Universal History from the Creation. Transl. Prof. Dr. William Adler & Paul Tuffin. Oxford: Oxford University Press, 2002. Ibn Ezra, Abraham ben Meïr, (1092–1167). Ibn Ezra's Commentary on the Pentateuch: Genesis (Bereshit). (Vol.1 – Genesis). Transl. and annotated by H. Norman Strickman & Arthur M. Silver. Menorah Pub. Co., New York, N.Y., 1988. Julius Africanus. Extant Writings III. The Extant Fragments of the Five Books of the Chronography of Julius Africanus. Niketas Choniates. O City of Byzantium, Annals of Niketas Choniates. Transl. by Harry J. Magoulias. Wayne State University Press, Detroit, 1984. Pliny the Elder. Historia Naturalis, XVIII, 210. St. Basil the Great. Hexæmeron. Nicene and Post-Nicene Fathers of the Christian Church, 2nd Series (NPNF2). Transl. Philip Schaff, D.D., LL.D. (1819–1893): Volume VIII – Basil: Letters and Select Works. Wm. B. Eerdmans Publishing Co., Grand Rapids, Michigan. St. Hilary of Poitiers. On the Trinity. Book IV. The Rudder (Pedalion): Of the metaphorical ship of the One Holy Catholic and Apostolic Church of the Orthodox Christians, or all the sacred and divine canons of the holy and renowned Apostles, of the holy Councils, ecumenical as well as regional, and of individual fathers, as embodied in the original Greek text, for the sake of authenticity, and explained in the vernacular by way of rendering them more intelligible to the less educated. Comp. Agapius a Hieromonk and Nicodemus a Monk. First printed and published 1800. Trans. D. Cummings, [from the 5th edition published by John Nicolaides (Kesisoglou the Caesarian) in Athens, Greece in 1908], Chicago: The Orthodox Christian Educational Society, 1957. Repr., New York, N.Y.: Luna Printing Co., 1983. Theophanes. The Chronicle of Theophanes Confessor: Byzantine and Near Eastern History, AD 284–813. Cyril Mango, Roger Scott, Geoffrey Greatrex (Eds.). Oxford University Press, 1997. Theophilus of Antioch. Theophilus of Antioch to Autolycus. Book III. Chap XXIV (Chronology from Adam) – Chap. XXVIII (Leading Chronological Epochs). Anthony Bryer. "Chronology and Dating". In: Elizabeth Jeffreys, John Haldon, Robin Cormack . The Oxford Handbook of Byzantine Studies. Oxford University Press, 2008. pp. 31–37. Dr. Iaakov Karcz. "Implications of some early Jewish sources for estimates of earthquake hazard in the Holy Land". Annals of Geophysics, Vol. 47, N. 2/3, April/June 2004. Fr. Patrick Henry Reardon. Creation and the Patriarchal Histories: Orthodox Christian Reflections on the Book of Genesis. Conciliar Press, 2008. Fr. Seraphim Rose. GENESIS, CREATION and EARLY MAN: The Orthodox Christian Vision. St. Herman of Alaska Brotherhood, Platina, California, 2000. Frederick Deland Leete. Christian Brotherhoods. Kessinger Publishing, 2003. Paul James-Griffiths. Creation days and Orthodox Jewish Tradition. AnswersinGenesis.org. March 2004. Paul Stephenson. "Translations from Byzantine Sources: The Imperial Centuries, c.700–1204: John Skylitzes, "Synopsis Historion": The Year 6508, in the 13th Indiction: the Byzantine dating system". November 2006. Pavel Kuzenkov. How old is the World? The Byzantine era κατα Ρωμαίους and its rivals. 21st International Congress of Byzantine Studies, London 2006. Prof. Charles Ellis (University of Bristol). "Russian Calendar (988–1917)". The Literary Encyclopedia. 25 September 2008. Prof. Dr. Marcus Louis Rautman. "Time." In Daily Life in the Byzantine Empire. Greenwood Publishing Group, 2006. pp. 3–8. Prof. Dr. Muhammad Shamsaddin Megalommatis. "Gueze – ‘Ethiopian’: the Counterfeit Millennium". September 8, 2007. Prof. Dr. Roger T. Beckwith (D.D., D.Litt.). Calendar, Chronology, and Worship: Studies in Ancient Judaism and Early Christianity. Brill Academic Publishers, 2005. (Dr Beckwith served for twenty years on the Anglican-Orthodox Commission). Barry Setterfield. Ancient Chronology in Scripture. September 1999. Chisholm, Hugh, ed. (1911). "Chronology" . Encyclopædia Britannica. 6 (11th ed.). Cambridge University Press. pp. 305–318. Dr. Ben Zion Wacholder. "Biblical Chronology in the Hellenistic World Chronicles". in The Harvard Theological Review, Vol.61, No.3 (Jul., 1968), pp. 451–481. Dr. Ben Zion Wacholder. Essays on Jewish Chronology and Chronography. Ktav Pub. House, 1976. Dr. Floyd Nolan Jones. Chronology of the Old Testament. Master Books, Arizona, 1993. Repr. 2005. (supports Ussher's chronology, i.e. 4004 BC). E.G. Richards. Mapping Time: The Calendar and its History. Oxford University Press, 1998. Elias J. Bickerman. Chronology of the Ancient World. 2nd edition. Cornell University Press. 1980. Fr. Stanley S. Harakas. The Orthodox Church: 455 Questions and Answers. Light & Life Publishing, Minneapolis, 1988. George Ogg. "Hippolytus and the Introduction of the Christian Era". in Vigiliae Christianae, Vol.16, No.1 (Mar., 1962), pp. 2–18. Howlett, J. "Biblical Chronology". In The Catholic Encyclopedia (New Advent). New York: Robert Appleton Company, 1908. Jack Finegan. Handbook of Biblical Chronology: Principles of Time Reckoning in the Ancient World and Problems of Chronology in the Bible. Hendrickson Publishers, 1998. K.A. Worp. Chronological Observations on Later Byzantine Documents. 1985. University of Amsterdam. Prof. Dr. William Adler. Time Immemorial: Archaic History and its Sources in Christian Chronography from Julius Africanus to George Syncellus. Washington, D.C. : Dumbarton Oaks Research Library and Collection, 1989. Rev. Philip Schaff (1819–1893), Ed. "Era." Schaff-Herzog Encyclopedia of Religious Knowledge New Edition, 13 Vols., 1908–14. Vol. 4, pp.163. Roger S. Bagnall, K. A. Worp. The Chronological Systems of Byzantine Egypt. Zutphen, 1978. V. Grumel. La Chronologie. Presses Universitaires France, Paris. 1958. Van der Essen, L. "Chronicon Paschale". In The Catholic Encyclopedia (New Advent). New York: Robert Appleton Company, 1908. Yiannis E. Meimaris. Chronological Systems in Roman-Byzantine Palestine and Arabia. Athens, 1992. John McClintock, James Strong. Cyclopedia of Biblical, theological, and ecclesiastical literature: Supplement. V.2. Harper, 1887. Prof. Fr. Arsenius John Baptist Vuibert (S.S.). An Ancient History: From the Creation to the Fall of the Western Empire in A.D. 476. Baltimore: Foley, 1886. Samuel Poznański. "Ben Meir and the Origin of the Jewish Calendar". in The Jewish Quarterly Review, Vol. 10, No. 1 (Oct., 1897), pp. 152–161. Sir Thomas Browne. Pseudodoxia Epidemica: Book VI. Ch. 1 – Of sundry common opinions Cosmographical and Historical. 1646; 6th ed., 1672. pp. 321–330. The Popular Encyclopedia: being a general dictionary of arts, sciences, literature, biography, history, and political economy. (Vol. 3, Part 1). Glasgow: Blackie and Son, 1841. Thomas Spencer Baynes. "Chronology: Era of the Creation of the World.” The Encyclopædia Britannica: a dictionary of arts, sciences, and general literature. 9th Ed., Vol. 5. A. & C. Black, 1833. pp. 709–754.